I do this with great trepidation, knowing that I am going to be shown up to be quite wrong, on all sorts of details. But without writing it up, I will never know. I am starting with Woolwich Arsenal’s first season in the Cup, although Royal Arsenal played in the Cup from 1889. Ashford United F.C. from Kent was formed in 1880 and were founder members of the Kent League playing at Godinton Road, Ashford. They closed in 1906 and the current club of this name is a youth club. This was the match in which two Arsenal players scored hat tricks for the first time. 2nd prelim round: November 4. Clapton (home). Won 6-2. Crowd, 2,500. Clapton were formed in 1878 and are still with us, playing in Newham. They were one of the founder of the Southern League in 1894/5, coming 8th out of 9 in the first season, in the first division. They won the FA Amateur Cup (a matter of great significance during the amateur era) in 1907, 1909, 1915, 1924, and 1925. They have since played in the Isthmian League but now play in the Essex Senior League. (This is not Clapton Orient who played Arsenal during WAFC was in the second division). Millwall Rovers were founded on the Isle of Dogs in 1885. In 1889 they changed their name to Millwall Athletic and became founder members of the Southern League which they won in 1895 and 1896. They moved to the Den in 1910 and thus became what people today like to call a “franchise” club, three years before Arsenal moved north. They moved south because there was limited support on the Isle of Dogs – just as Arsenal moved north because support was collapsing as the factories closed at Woolwich. There’s a description of their first match at the Den in “Making the Arsenal”. This cup tie shows that the crowds would turn out for the right match, and the game against Millwall was the most local of derbies. The highest league attendance that season was 13,000. 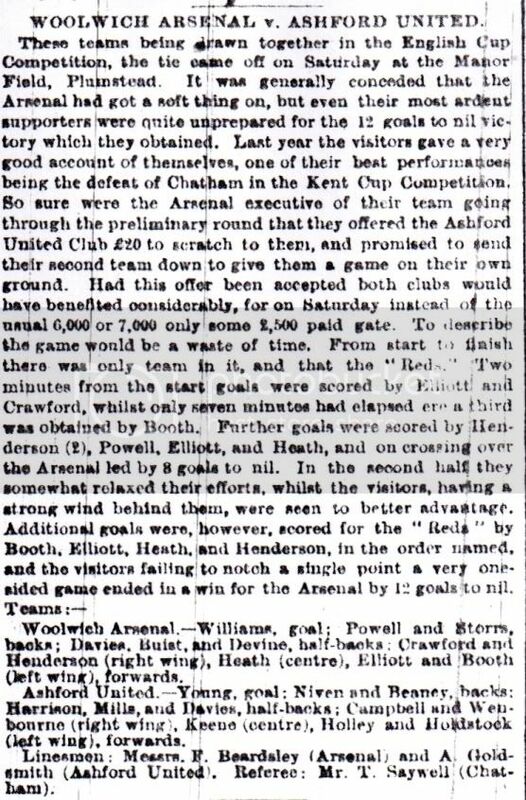 Milwall Athletic who we played in the previous round had tried to launch a Southern League in 1894, after Royal Arsenal’s earlier attempt had failed. At the 1894 meeting they attracted among others Clapton, and the 2nd Scots Guards. More teams came and went, and ultimately the Scots Guards opted out (Southampton took their place). This match is the only record I can find of the 2nd Scots Guards in the FA Cup – although I guess they must have played others (even if they got a bye this year). It is interesting to see that this game is recorded as getting a result after extra time – so extra time in the first, not the second match in those days. 1st round proper. Jan 27. The Wednesday (home). Lost 1-2. Attendance 15,000. The Wednesday were a first division club at the time, having entered the league the year before. They finished 12th this season. A further thought on attendance – although I can’t say anything about the weather, it is noteworthy that the local derby against a non-league team got a bigger attendance than a meeting with a first division side. Overall, during this cup run James Henderson played four matches (he missed the Sheffield game) at inside forward and scored seven goals. Arthur Elliot played five games and scored five goals. Sorry about the missing players – I will get to them eventually but if you have any info, do let me know. Here is match report for the Millwall game. It’s interesting to note the two linesmen are representatives of Arsenal (A.Brown) and Millwall (W.Kitson). And here is a match report for the game against the 2nd Scots Guards. 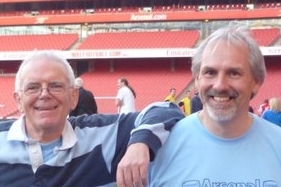 The Scots Guards’ goalkeeper, Fred Wood, played for Arsenal against City Ramblers in the previous seasons FA Cup competition. An interesting postscript that links the games against 2nd Scots Guards and Millwall Athletic. 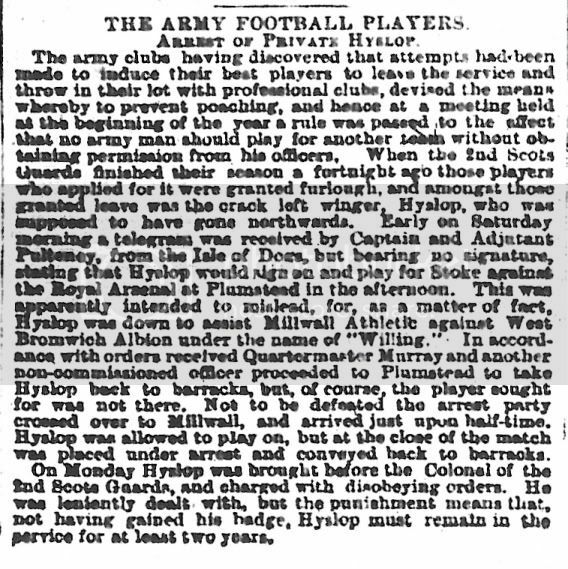 Private T. Hyslop who played for the 2nd Scots Guards also played for Millwall Athletic under the assumed name of “T. Willing”. And a report on the game against Ashford. Can you imagine something like this happening today? If it were possible I wouldn’t put it past Manchester City to try it in attempt to win some silverware. Thanks for the summary, Tony. Andy’s reports are wonderful period pieces. vs Millwall: “….the forwards…played the short passing game uncommonly well…might, with a little more alacrity in front of goal, have added considerably to their reputation” echoes a few of our more shot shy performances in recent years. vs Scots Guards – I too had assumed that extra time was a relatively modern (perhaps FIFA) invention. But there it is, 15 mins each way. And I had no idea that teams like the Arsenal (and notice how, in reports, that, or “the Reds” is how they are referred to) would be followed by “thousands” of away supporters in Victorian times. There’s a side issue to be explored here – how did the Arsenal build up such a large following in such a short time? Poor Hyslop. A poor private whose crime was wanting to play football. And finally, notice how the Arsenal linesman against Ashford was F Beardsley, presumably Fred. You are correct that the crowd is an issue that requires study. Hopefully you will be pleased to know that we will have a number of chapters in the forthcoming book “Woolwich Arsenal the club that changed football” based exclusively on original research about the crowd both at home and away during the period 1893-1913. It was commonplace back then to have a neutral referee and a linesman from each of the teams playing. William Parr was also a regular linesman during Arsenal games. Mr Watson, I can’t help at all with this, but I will get in touch with others who might know. Arsenal at the time you specify were active in various fund raising activities, including their archery competition which gained a certain notoriety, and it would not surprise me if the medals relate to further activities like that. In 1893 Arsenal were not only moving into the Football League, they were also moving into a new ground, and fighting off the unwelcome attentions of the rebels within the club who went on to form Royal Ordnance Factories FC, so again it seems likely these were funding raising events.